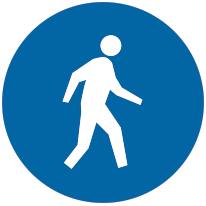 Enjoy the beautiful Waterfront views by choosing to walk to your destination. Follow the Promenade or cut back into one of unique Baltimore neighborhoods featured along the Waterfront. 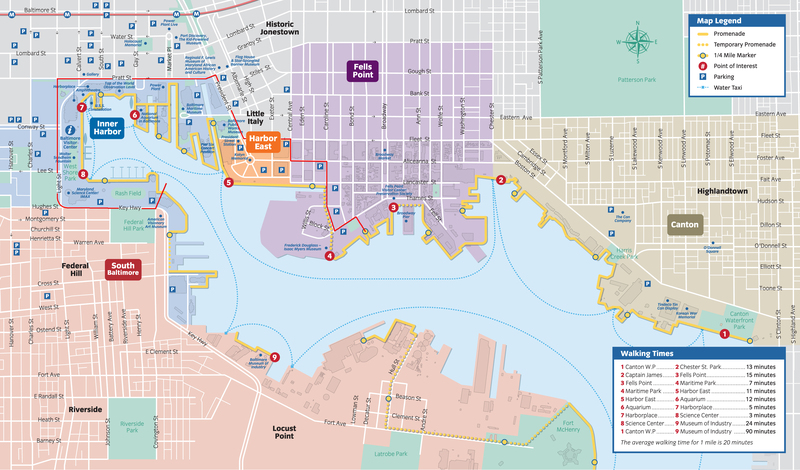 Use our Waterfront Walking Map as a reference for distance and destinations! From Owings Mills, Randallstown, Pikesville, Cold Spring to Mondawmin, you can ride the MTA’s Metro Subway to the Shot Tower Station (located on Baltimore Street at President Street). From here you can walk 5 blocks straight down President Street or catch the free Charm City Circulator Green Route to reach Harbor East. If you opt to get a Charm Card, you can travel cash-free for a safer and easier commute. You can sign up for real-time alerts to be in the know about any delays. Trains run every 8-10 minutes during morning and evening peak times, every 11 minutes during weekday evenings, and every 15 minutes on Saturdays, Sundays and holidays. This MTA commuter rail system has two lines that connect to Baltimore. On the Penn Line service operates from Perryville, Martin Airport in the north and from Bowie, Odenton, BWI Airport, Halethorpe and West Baltimore to Baltimore. Penn Station. Penn Line service operates 7 days /week. From Penn Station catch the free Charm City Circulator Purple route and switch to the Orange Route at Pratt Street to reach Harbor East. On the Camden Line service operates from Washington with stops including Greenbelt, Laurel and Savage, Jessup to Baltimore’s Camden Station. Camden Line service operates Monday through Friday only. From Camden Station, catch the free Charm City Circulator Orange Route on Pratt Street to finish your trip to Harbor East. MARC Service fares vary by distance travelled; Daily weekly or monthly tickets are available. For real-time train status visit www.marctracker.com. Ride the Light Rail Line, if you come from the north (Hunt Valley, Timonium, Mount Washington) or the south (Linthicum or Glen Burnie). 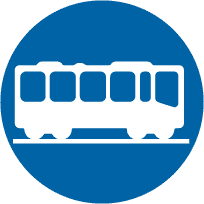 Ride a Light Rail train to the Convention Center stop where you can catch the free Charm City Circulator Orange Route on Pratt Street to finish your trip to Harbor East. At day’s end you do the reverse. 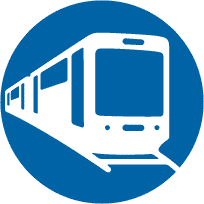 LRT operates weekdays from 6am to midnight. There is no need to carry cash, just get a Charm Card for a more convenient and safer commute. You can sign up for real-time alerts to be in the know about any delays. On Line Trip Planner and LRT schedule available at http://mta.maryland.gov/content/transit-information or call 410-539-5000. 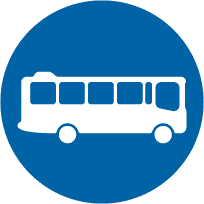 Ride a Local Bus, Quick Bus or Express Bus service in the Baltimore Region. Bus frequency and hours of operation vary by route. Online at MTA you’ll find the Trip Planner and route timetables. There is no need to carry cash, just get a Charm Card. You can also sign up for real-time alerts to be in the know about any planned bus diversions. Combine this route with walking for a completely free trip! With four different routes that run north, south, east and west, the Charm City Circulator is a convenient and wallet-friendly way to get around. For more information, and route details, visit the Charm City Circulator website. This free option allows you to skip the traffic around the Waterfront while enjoying the open air and beautiful waterfront views. 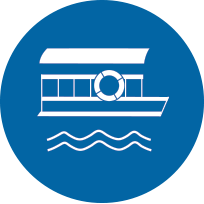 With five stops and a schedule that runs every 15 minutes, the Baltimore Harbor Connector is the way to go if you want a hassle-free, relaxing ride on the river. Routes include services to Maritime Park, Tide Point, Harbor View, and Harbor East. More information can be found on the Harbor Connector website. Save money, stay healthy, and take a commute that has short travel times than driving. No bike? No problem! 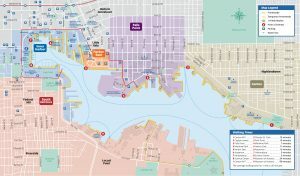 Enjoy a pedal-powered commute with Baltimore Bike Share With multiple city-wide convenient Bike stations throughout the Downtown and Inner Harbor area, this system not only makes biking accessible and affordable, it also includes a stock of electric assist bikes, making your trip easier! Learn more here. Over 70% of employees surveyed rated biking as an excellent or good commute and a 20 minute commute can burn over 300 calories on a daily basis. View the Bike Maryland bike map for detailed routes and information. 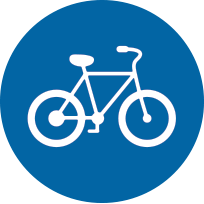 Schedule: Please note that biking on the Promenade from the Rusty Scupper to Pier 4 is only allowed Monday through Saturday 6am to 10am and Sunday 6am to 11am. The Jones Fall Trail provides an easy, convenient alternative to navigating around the Inner Harbor at all other times.